Was Bengaluru's Bellandur lake fire planned by landgrabbers? There is more to the Bellandur lake fire than meets the eye, say sources in the Bangalore Development Authority and Bengaluru Development Ministry. BENGALURU: There is more to the Bellandur lake fire than meets the eye, say sources in the Bangalore Development Authority and Bengaluru Development Ministry. 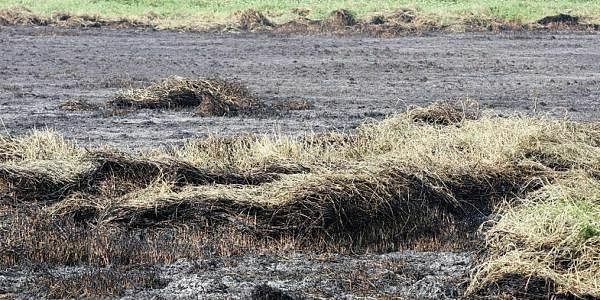 Land sharks may have been behind the recent headline-grabbing fire on the lake and it is premature to conclude that toxic froth or garbage burning ignited it, they say. Soon after the fire was reported, a team from the BDA and ministry visited the spot, taking videos and pictures. “After the survey, the team realised that the fire was man-made. Even when the lake is full, the water does not reach the place where the fire took place,” said a BDA source. Some residents had suspected that someone burnt waste and that’s how the fire erupted in the lake. But team members say it would require a huge quantum of waste to cause a fire of such intensity. “This is a clear case of deliberate fire, perhaps by land grabbers. In fact, a few goons tried to stop the team from reaching the actual spot behind Embassy Pristine Apartments where the fire took place,” said a BDA source. However, citizens say the lake is filled with toxic chemicals and has turned into a dumping yard. Workers hired by BBMP subcontractors are often seen dumping garbage or debris and setting them on fire. They say the burning ignites the chemicals in the lake. They also point out it is not the first time Bellandur lake has caught fire. Experts said that the lake caught fire in 2015 because of the phosphorus and oil on the surface. Bellandur lake has been spewing froth for over eight years now. The major problem is the untreated sewage that has been flowing into the lake primarily from HAL, Domlur, Koramangala and Agara. Meanwhile, citizens are miffed that civic agencies like BWSSB, BDA, BBMP and KSPCB are busy passing the buck while the government has kept silent on the issue.